Food for Thought offers a rounded Canadian perspective on food and food industry from contemporary viewpoints spanning sociology, epidemiology, psychology, nutrition, economics, folklore and many more. The editors have assembled a range of accessible chapters that make sense of the whirlpool of facts and figures that saturate current debates about obesity, breast-feeding, fishing, and food security among a host of other salient topics. The volume raises awareness about the diversity of opinions about food and what the science of food is telling us about what we eat. The accessibility of such discussion is bolstered by the tone of the authors collected in the volume: reticent, critical and concerned, far from alarmist. 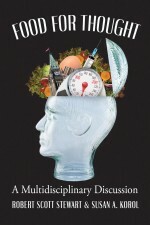 The diversity of the volume is structured by four broad thematic categories: philosophy and psychology, food science, food and economics, and food and politics. The opening section humanizes the discussion of food, making it accessible to a wide audience by making a matter of life, identity and consciousness. Topics range from the meaning of food, the place of food in our sense of self and other, the interplay of food and the diet industry, and the ethics of provincial cuisine. The emphasis on the philosophy and psychology of food in this opening section serves to open up the social and cultural importance of food for a general audience. The food science section follows the philosophical unveiling and is much shorter, exclusively focusing on mothers' food choices for infants and how food choice affects children. Parents' roles in caring for the health of their children and in establishing good eating habits is intimately woven and uses plural voices to sift through the evidence and the facts of how parents feed their children. Food for Thought changes its tone halfway through with a frame more drawn from the applied sciences. Focusing on issues of justice and sustainability, the book charts the economic trends of seafood consumption and the place of agriculture in a globalized marketplace where food moves as a commodity. The section concludes with an interesting comparison of the food security challenges facing Zambia, Zimbabwe and India. The final section of Food for Thought briefly sketches the politics of the slow food movement. Given its rising popularity and reactionary interest in off-setting the fast food culture of the developed world, this section is an important exposition for a general audience who may view the only alternative to obesity epidemics to be a diet culture or to food crisis to be state socialization or corporatization of food sources. There are a number of sections in the volume that touch upon or are invested in explicitly Canadian topics. The generally accessible and universal tone of the opening sections protects these specific case studies from lapsing into a provincialism. This speaks to the broad appeal of the book and the good work of the editors and authors in constructing a discussion that remains objective while working through some fascinating and potentially inflammatory material. The attention to contemporary food crises in Food for Thought emphasizes a number of dualities in current normative judgments about what we eat and how we should proceed with food production and consumption. Diet and obesity are intimately connected phenomena, as are socio-economic class and food choice. The editor Robert Scott Stewart presents the general theme of the book's approach to unraveling these dualisms in the introduction. Touching upon the famous claim of nineteenth century gourmand Anthelme Brillat-Savarin, "Tell me what you eat, and I will tell you what you are," Stewart identifies "We are what we eat in a very broad sense that includes what we consider the significance of what we eat, with whom we eat, how we choose to prepare what we eat, and […] the choice not to eat something even when, physiologically, it is perfectly edible." Food for Thought gifts us with a developed, perhaps even dialectical materialism that insists on food in its many facets and how this plurality of one seemingly simple thing -- food -- can be inflected, reflected and distorted by its place in human civilization. If there is one concern with this book it is that the format does not facilitate depth of discussion. Many of the more scholarly chapters survey a limited but nonetheless important range of relevant literature. The multidisciplinarity of Food for Thought does well to circumvent this issue to some extent. In this vein the book ought to be considered a way of getting proverbial taste of current state of discussions around food, production, consumption and society. It may suit a general audience interested in an informed discussion of the facets of food. Dr Daniel Hourigan teaches and writes on philosophy, law, psychoanalysis and culture at the Socio-Legal Research Centre and Griffith Law School.